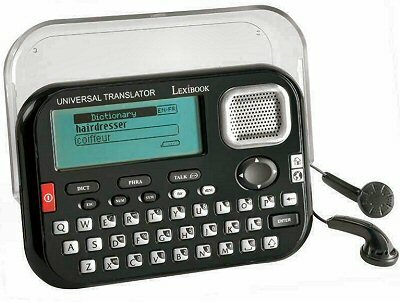 Every now and then, a new product comes along that really changes the way people think about a product-type, and the MT1500 electronic translator from Lexibook certainly is one of those. Using the latest TTS (text-to-speech) voice technology, the words in the dictionary can be spoken out with such clarity, it is almost like listening to a recoding of a real person. This helps enormously if you are learning languages and wish to learn the correct pronciation. It is also extremely useful if you want to communicate something in a foreign language to someone without having to try to pronounce it yourself. The Lexibook MT1500 is a state-of-the-art pocket electronic dictionary that translates between 15 European languages English, German, French, Spanish, Italian, Portuguese, Polish, Dutch, Swedish, Finnish, Danish, Hungarian, Norwegian, Russian, Chinese - making this an ideal companion for anyone with an interest in foreign languages, or for those travelling, living or working abroad. This pocket translator boasts over ONE MILLION quality translations elaborated by professional linguists, which is more than enough to cope with almost all situations in which you will find yourself. In addition, each language is complimented with 10 categories of commonly needed phrases, including: business, restaurant, hotel, city, travel, emergency, leisure, bank, post office, telephone, airport and general. Best of all about this translator is its simplicity (switch on and go), dictionary quality, incredibly natural-sounding voices, and favourites function to allow you to target learning at those words you have needed to look up. Manufacturer`s guarantee for 12 months from date of delivery. The compact MT1500 is the linguistic aid that slips easily into your pocket and will help you to understand and discover the world around you. The compact MT1500 translator is a real linguistic tool enabling you to learn, translate and travel in confidence. 15-languages: French, English, German, Spanish, Italian, Portuguese, Dutch, Swedish, Norwegian, Danish, Finnish, Hungarian, Polish, Russian and Mandarin Chinese. 10,000 headwords and 500 sentences database per language. Thanks to its speaking function, listen to 5,000 pronounced words per language. In travel mode, listen to 100 complete sentences classified in 10 categories per language. Giant display 6 lines for easy reading. Favorites list: for important words to remember or daily used ones. 12-digit calculator with integrated euro convertor. Memo. Clock.